Lough Allen Hotel on the shores of Lough Allen in Co. Leitrim is a short walk to the town of Drumshanbo and is only 14km from Carrick-on-Shannon. Stay in one of our 64 stylish en-suite rooms or in one of our two bed apartments. Choose from contemporary standard rooms which have everything you might need for a great stay in Leitrim, beautiful executive rooms with the little extras, or a Junior luxury suite for the ultimate Lough Allen Hotel & Spa experience. There is free wifi in all bedrooms and public areas. Our main aim at Lough Allen is to meet the objectives of the conference organiser. We are suited for residential conferences; with a fitness suite, swimming pool, hot tub, sauna and steam room available to unwind after a day of work. The Lakeside Bar and Bistro serves snacks and lunch. In summer there is outdoor seating overlooking the lake. 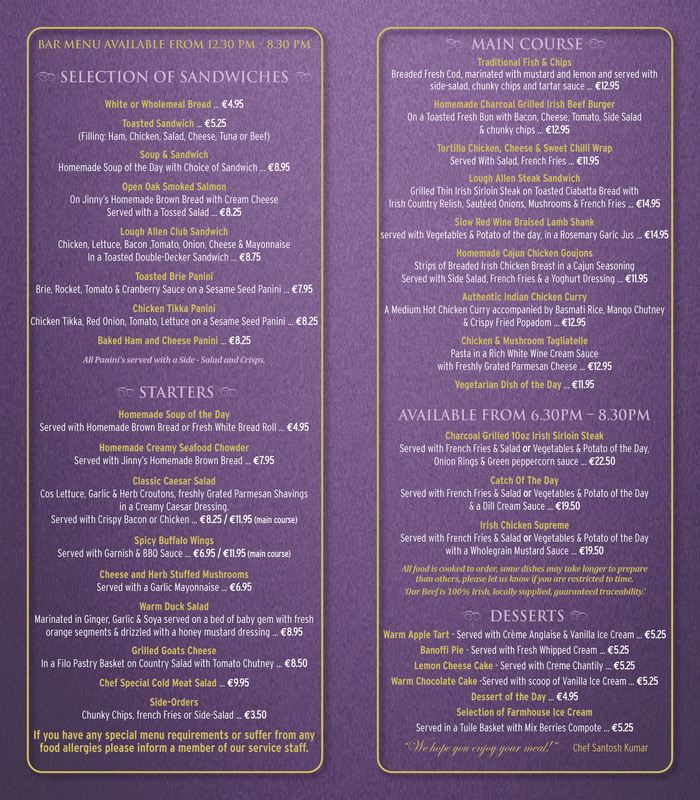 Lakeside Bar and Bistro menu. Rushes Restaurant serves dinner daily from 6.30pm until 9pm with the exception of Sunday when it is open for lunch but closed for dinner. The Lakeside Bar & Bistro is open for meals on Sunday nights. Rushes Restaurant menu. The leisure centre is fully equipped with cardiovascular and resistance training equipment with a team of highly trained staff to help you at any time. There is also a wide range of classes available; yoga, aqua aerobics, and Get Fit classes. Hotel guests are more than welcome to join in on any class happening during their stay, (a nominal charge may apply for some classes). A swimming pool, hot tub, sauna and steam room are other amenities on offer in the leisure centre. Our luxurious Oshadi Spa is a haven of relaxation and pampering with a fantastic range of spa/wellness treatments. One of our fully qualified health and beauty professionals will assist you with relaxing massages, skin tingling facials and soothing body wraps. Lough Allen Hotel & Spa is fast becoming the venue of choice for engaged couples throughout Leitrim and beyond. Our all inclusive wedding packages are some of the most attractively priced to be found anywhere!